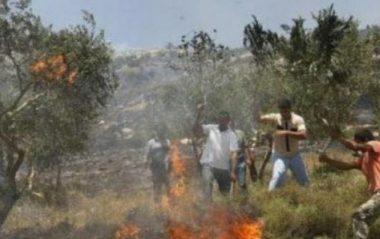 A group of extremist illegal Israeli colonizers invaded, on Thursday at noon, Palestinian orchards near the junction between Burqa and Sielet ath-Thaher town, south of the northern West Bank city of Jenin, injured one woman and burnt at least 30 olive trees. The colonizers invaded the Palestinians orchards, and attacked many villagers, injuring a woman, identified as Darin Mustafa Abu al-Haija, causing mild-to-moderate wounds. They also burnt at least thirty olive trees during their invasion into the Palestinian orchards. Two days ago, the colonizers fired many live rounds at the Palestinian in the same area, reportedly after a Molotov cocktail was hurled at a one of their cars. Also Thursday, a Palestinian woman was injured after extremist colonizers attacked her with stones at the entrance to the village of Burqa, to the north of Nablus.